Within a short walking distance, Disney Contemporary Bay Lake Resort Tower guests will find several dining experience options, multiple shopping opportunities, and direct transport to the Magic Kingdom all located on site. Situated on the shores of the Seven Seas Lagoon in the heart of Disney’s most popular resort area, this beautiful resort offers spectacular views and one of a kind convenience to Disney’s Magic Kingdom Park. In addition, numerous activities and amenities are conveniently located for each family member’s enjoyment. Another option is to stroll over to the front entrance to the Magic Kingdom on your own. Enjoy all of this while enjoying the breathtaking views of Cinderella’s castle, the Grand Floridian, and the Polynesian resort which are scattered around the Seven Seas Lagoon. You can also enjoy the nightly firework display at the Magic Kingdom from many locations within the resort. Imagine the variety of food, fun, and entertainment for the entire family all in one place and in sight of the most magical vacation spot in the world. Disney’s Contemporary Bay Lake Resort Tower is connected to the original building of the Contemporary Resort by a Sky Way Bridge. As the oldest resort property at Disney’s Florida theme park location, the Contemporary Bay Lake Resort is famous for its A-shape and the fact that Disney’s monorail system passes through the building and actually makes a stop for passengers inside. The Bay Lake Tower, with its crescent-shaped design, stands as a modern addition to this Disney icon resort. Inside the main building at the Contemporary Bay Lake Resort are four unique Disney restaurants. Chef Mickey’s features buffet meals complete with visits from several favorite Disney characters including Mickey himself. The Wave Restaurant offers American cuisine in a modern atmosphere, and the Contempo Café is quick service style and is located near Chef Mickey’s. In keeping with the marvel of this awesome resort, the California Grill, on the top level of the Contemporary’s main building, offers amazing menu options to go along with views of the Magic Kingdom like none found anywhere else. 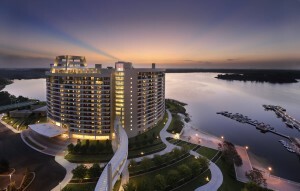 The rooms in the Contemporary Bay Lake Resort Tower vary in size and style and will sleep up to 12 people. Depending on the specific room, there are kitchenettes all the way up to full-size kitchens. With many modern features including granite counter tops, these villas are like your condominium back home. This wonderful resort boasts several Disney-style amenities as well. In addition to the views, there is easy access to tennis courts, a health club, a spa, white sandy beaches, water activities including personal watercraft rentals, and a swimming pool. In the tradition of fine Disney accommodations, there is something for everyone in your party. Even though Disney’s Contemporary Resort Bay Lake Tower is in close proximity to the Magic Kingdom, transportation to Epcot, Animal Kingdom, Hollywood Studios, Downtown Disney, Blizzard Beach, and Typhoon Lagoon are also just a short distance away. As one of the premier Disney resorts, you can enjoy convenience and views unique to its location while being pampered like the special guest that Disney knows you are. Come experience vacation the Disney Contemporary Resort way.